Decades before the USO tours started in 1941, a prototype version called the Liberty Theaters was started in 1917. Marc Klaw, a member of the Commission on Training Camp Activities, was tasked with building 16 such theaters for up to 600,000 soldiers to view. “We will have eight companies on the road all the time, four dramatic and four vaudeville,” Klaw said. “Plays will be up to date, and only first-class performers will be engaged.” Irving Berlin was one of the first performers to sign up. The modern version, the USO, has 160 locations around the world and has entertained an estimated 75 million Americans throughout its history. As the government asked Americans to spend more conservatively in the early months of WWI, one way in which people could save money quickly became apparent. 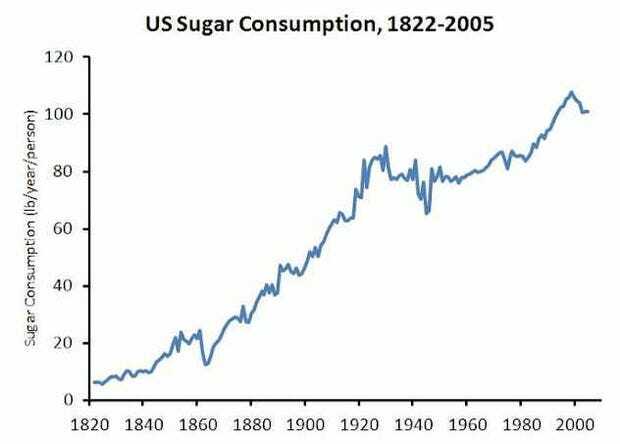 Americans may have cut back on the sugar intake during WWI, but alas the trend didn’t stick. Per capita sugar consumption is now more than 100 pounds per year. And America consumes by far the most sugar per capita of any nation.